Secretary of State Kerry speaks at The United States Institute of Peace on U.S. strategy in Syria and the Middle East just before heading back to Vienna for more talks on how to resolve the crisis, Nov. 12, 2015. Secretary of State John Kerry says the U.S.-led coalition will be doing more in the coming weeks to degrade the Islamic State’s ability to produce and sell oil and gas, which helps fund the terrorist group's military operations. He commented at a Washington forum on Thursday ahead of a three-nation tour that includes talks in Vienna on Syria’s political future. “The rise of Daesh is directly attributable to the policies and actions of the Assad regime,” said Kerry, referring to the Islamic State. He said the coalition has launched more than 8,000 airstrikes in Syria and Iraq, significantly degrading the Islamic State’s leadership. He also said the coalition has cut into the amount of territory under the militant group’s control. On Saturday, officials from 17 countries plus the U.N. and European Union will meet in Vienna for their second round of talks on Syria. “I cannot say this afternoon that we are on the threshold of a comprehensive agreement,” said Kerry. “There remains a lot of work to be done,” he added. In a communiqué at the end of the first round of talks in October, the world powers, the U.N. agreed on the importance of accelerating diplomatic efforts to end Syria's civil unrest. They also agreed to a U.N.-led process that would include talks between the Syrian government and the moderate opposition, along with a possible ceasefire. But stark differences remain over some issues, including the status of Syrian President Bashar al-Assad. At the end of the first round of talks, Kerry said, "Sergey Lavrov and Foreign Minister Zarif and I and others agree to disagree." Kerry was referring to his Russian and Iranian counterparts. 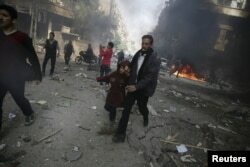 "The United States' position is there is no way that President Assad can unite and govern Syria," he said. FILE - A man holds the hand of a girl as they rush away from a site hit by what activists said were airstrikes by forces loyal to Syria's President Bashar al-Assad, in the Douma, Syria, Nov. 7, 2015. It circulated a plan for ending the Syrian war that calls for drafting a new constitution in up to 18 months. However, Syrian opposition groups said the plan is unacceptable because Russia's goal would be to keep Assad in power. Western diplomats have indicated the plan will not be a focal point in upcoming talks. ​"There is no meaningful moderate opposition," said Anthony Cordesman, a defense and security analyst at the Center for Strategic and International Studies. "There are people who have a certain credibility as figures," he added. "They do not represent any clear factions or large majority of Syrians," he added. However, the makeup of the Vienna talks could help produce progress on this issue, says Perry Cammack, a Middle East Analyst at the Carnegie Endowment for International Peace. However, the country's economy, in particular its tourism sector, has slowed following deadly terrorist attacks in March and June. Islamic State militants claimed responsibility for both attacks. Kerry will meet with officials including President Beji Caid Essebsi, as part of the second U.S.-Tunisian Strategic Dialogue. The talks are also a follow-up to Essebsi's May visit to Washington. 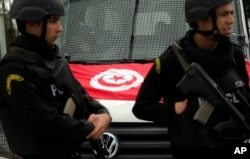 FILE - A Tunisian national flag is seen on a police vehicle as policemen stand guard following an attack by gunmen in Tunis, Tunisia, March 20, 2015. "We have been standing firmly with Tunisia since the revolution," said a senior State Department official in a Thursday briefing. "We have provided over $700 million in assistance across the fields of economic support, development support, security, governance and so on," the official said.